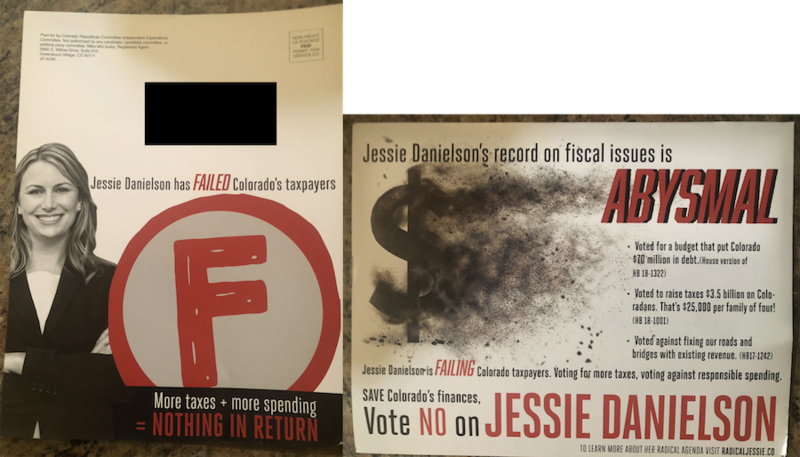 This mailer from the Colorado Republican Committee super PAC claims Democratic state Rep. Jessie Danielson "has failed Colorado's taxpayers." She is running for an open Senate seat against Republican businesswoman Christine Jensen. Her vote for a budget that would put the state in debt. The Colorado Constitution requires a balanced budget, so an unbalanced budget could not be passed. Her 2017 vote against an amendment to a transportation bill that would have required the use of existing revenue for roads and bridges. The measure asking voters to increase taxes for transportation failed in the state Senate. You can find Danielson's ratings from various groups and links to details at VoteSmart.